No. Not that one. Not the General Omar Bradley of World War II fame and former Chief of Staff of the US Army. Omar came into my life in early September of 2008. I had recently graduated seminary and began my first appointment as a full-time minister in the United Methodist Church. Having been a dog lover since childhood, and having been unable to have a dog for several years, I was anxious to adopt a new puppy. On a whim, I visited the McDowell County Humane Society, not expecting to make an adoption that day. Fate would have it, though, that the shelter had a litter of 8-week old puppies. Omar was the most quiet and most shy. He hid in the back of the room as I played with each of the other pups. He was the last one I picked up, but the moment he was in my arms, he nuzzled his head under my chin and I knew I had found my new dog. As we left the shelter and walked past the pens of older dogs, a cacophony of barking erupted, and Omar cowered against me, cementing our relationship for the next five years. On October 14, 2013–a little more more than five years after adopting him, Omar died. The next three days were a spiral downward into confusion and helplessness as he became more and more ill. And yet, he remained the same sweet dog I had met on that September day so long ago. Even as his body began to fail him, his kidneys shut down, his balance became unsteady, and his mind became fogged with confusion and disorientation, my Omar was still wagging his tail and giving strangers affection. When the emergency clinic workers brought him into the obvservation room to euthanize him, his sad eyes lit up and his tail furiously wagged as he caught sight of me. Despite the obvious terrible condition he was in, he pressed against me, nuzzling his head under my chin the same way he had five years earlier… I held him tight as the drugs took effect, the tail slowed and stopped, and his sweet eyes closed for the last time. My heart shattered… and yet, the fact that he left my life the same way he had entered it reminded me of the wonderful blessing I had stumbled over just a few short years earlier. Hard as that night had been, it was the next few days that really hurt, though. It took me two days before I could put away the last meal he had never eaten. It was only when the cat began sitting in front of it, waiting for the dog to chase her away, that I realized I needed to pick it up. There was the blanket that smelled like him that I cried over washing. It’s funny–A few days can so change an attitude. Saturday night I had noticed the blanket smelling like dog and thought I should wash it. Tuesday night I held the blanket, crying because it smelled like him and I didn’t want to wash it. Ever. There are the slobbery nose prints on his favorite window that I still can’t make myself wash away. I’ve passed on his treats to a neighbor’s dog… one Omar used to like to play with. His food I gave to a new dog owner. One week after he passed away, I received his ashes and placed them on the mantel with his collar and favorite toy, not sure what to do with them next. It seems that every day another little part of Omar disappears from my life. His fur is swept up and dusted away and he’s not here to shed afresh all over everything. The cat is slowly returning to normal and accepting the absence of the dog she once hated but came to love. I’ve stopped feeling like I want to cry when I walk through the door and am not greeted by his wagging tail and happy face. But I still miss him when I curl up to sleep and he isn’t cuddling up next to me. It’s then that I think of the last time he fell asleep, and I’m glad I was there to hold him and love him in his last moment… but it still hurts. And despite all the pain of losing a pet who was so much more than a pet to me, I know that I am blessed to have had him at all. Omar was a surrogate child–one who loved me unconditionally, even when I did not deserve it. When I was a less than perfect friend and companion to him, he was forgiving. He never got tired of playing the same silly games because they made me happy and that made him happy… and we liked to see each other happy. He never failed to meet me at the door… even when his kidneys had completely shut down and his body was weak. He was loyal and faithful and so full of love I often wondered if he wasn’t an angel in disguise. The tears come less often now. The hurt is fading. I still miss him, and I supposed I always will… but I know that he had been a gift from God and so I can never allow myself to begrudge having him, even if it meant I would have to lose him too quickly. In his honor, I have made an important decision, though. Because he loved me so unconditionally, I feel the best thing I can do is to show another dog that same sort of love. 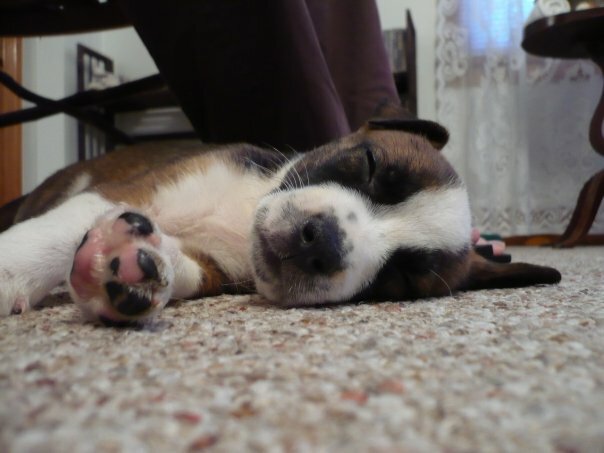 When I adopted Omar, I was led to believe he was a boxer… however, as he grew, it was clear he was a pit bull mix. Had I known that the day I walked into the shelter, I would not have even considered him as a pet… but by the time I realized what he was I was so enamored I couldn’t imagine life without him. Through Omar I learned to love more broadly, not to judge any living being because of their label, and that love and compassion are the most important aspects of any relationship. Now, when I see a bully type dog, even full-blooded Pits, all I can see are big babies who want to please and be loved. I see a blessing… blessings that are so often abused by mean and malicious people. So, in honor of Omar, when the day comes that I am ready to have another dog in my life, I will adopt a pit bull, or pit-mix. Because Omar showed me what unconditional love is, I feel the best way to honor his memory is to share that love forward with a dog who may not find it elsewhere. I sometimes laughed because my General Omar Bradley was a coward who frequently hid behind me and sought me out when he was afraid… so completely different from his namesake who charged fearlessly onto battlefields and confronted evil face-to-face. But now that our lives together have been completed, I realize that he was far braver than I had ever given him credit, because he dared to love the people who were most afraid of him, and he never let labels define who and what he would be. Rest in peace, General. I love you. I miss you. And I am truly blessed because of you.